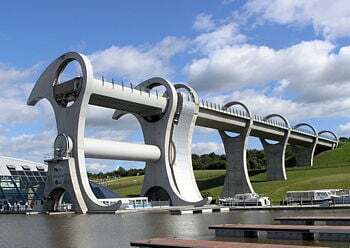 The Falkirk Wheel in Scotland. Civil engineering is a broad field of engineering covering many specialties. It includes construction engineering, environmental engineering, fire protection engineering, geotechnical engineering, hydraulic engineering, structural engineering, and transportation engineering. The term "civil engineering" was first used in the eighteenth century, to distinguish it from military engineering. Most civil engineering projects today deal with the planning, construction, and maintenance of power plants, bridges, roads, railways, structures, water supply systems, irrigation, pollution control systems, sewer systems, and flood control systems. Much of what is now computer science was driven by civil engineering, where problems of structural and network analyses required parallel computations and the development of advanced algorithms. General civil engineering deals with the overall interface of fixed projects with the greater world. General civil engineers work closely with surveyors and specialized civil engineers to fit and serve fixed projects within their given site, community, and terrain. They design grading, drainage (flood control), paving, water supply, sewer service, electric and communications supply, and land (real property) divisions. They spend much of their time visiting project sites, developing community and neighborhood consensus, and preparing construction plans. General civil engineers may also be referred to as municipal engineers, though this term is usually reserved for engineers employed by a municipality. Construction engineering involves planning and managing the construction of structures such as highways, bridges, airports, railroads, buildings, dams, and reservoirs. Construction of such projects requires knowledge of engineering and management principles and business procedures, economics, and human behavior. In addition to designing structures, construction engineers perform such tasks as cost estimation and control, planning and scheduling, equipment selection, and materials procurement. Wastewater treatment is a critical activity in environmental engineering, a sub-discipline of civil engineering. Fire protection engineering, also called "fire safety engineering," is the application of science and engineering principles and experience to protect people and their environments from the destructive effects of fire. The underlying branches of science are fire science, fire dynamics, and chemistry. Fire protection engineers are often civil engineers by training. They typically design safeguards that aid in fighting fires, such as alarm, sprinkler, and smoke-control systems. They are also involved in structural design, providing expert advice on choices of materials and the protection of structural components. In addition, they are employed as fire investigators, including such large-scale cases as the analysis of mechanism the collapse of the World Trade Center. NASA uses fire protection engineers on its space program to ensure safety. The field of geotechnical engineering is mainly concerned with the design of foundations to support structures, embankments, retaining walls, and the like. The geotechnical engineer needs to take into account the properties and mechanical behavior of the soil, including soil fluidity, compression, swelling, seepage, and slopes. The engineer designs ground and rock anchors, decides on the use of synthetic tensile materials in soil structures, and considers soil-structure interactions. In the field of civil engineering, structural engineering involves the design and analysis of structural components of buildings and nonbuilding structures. It includes calculating the stresses and forces that affect or arise within a structure. Major concerns are related to the designing of structures that are resistant to seismic activity (earthquakes and explosions that cause the earth to shake) and retrofitting existing structures for seismic resistance. Materials that have broad applications in civil engineering include concrete, aluminum, and steel. Additional materials with potential applications include polymers and ceramics. Thus, civil engineering includes materials science. Surveying is a technique and science required for the planning and execution of nearly every form of construction. Elements of a building or structure must be correctly sized and positioned in relation to one another and to site boundaries and adjacent structures. Civil engineers are trained in the methods of surveying and may seek Professional Land Surveyor status. 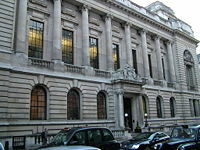 The Institution of Civil Engineers headquarters in London. Prior to becoming a practicing engineer, civil engineers are generally required to complete college or other higher education, followed by several years of practical experience. Each country, state, or province has its regulations for civil engineering practice. In the United States, one must become a licensed professional engineer to do any civil engineering work affecting the public or to legally represent oneself as a civil engineer. Licensure requirements vary slightly by state, but in all cases they entail passing two licensure exams—the Fundamentals of Engineering exam and the Principles and Practice exam (commonly called the PE)—and completing a state-mandated number of years of work under the supervision of a licensed professional engineer. In addition, an educational requirement must often be met. All states accept a four-year Bachelor of Science (BS) or Bachelor of Engineering (BEng) degree in civil engineering from an accredited program. The acceptability of degrees in other fields varies by state; some states allow a person to substitute additional years of supervised work experience for the degree requirement. Advanced degrees are currently optional for civil engineers in the United States. Graduate study may lead to either a Master of Engineering or a Master of Science degree, followed by a Ph.D. in civil engineering or sub-discipline. In the United Kingdom, current graduates need to have a Master of Science, Master of Engineering, or Bachelor of Engineering (Honors), to become chartered through the Institution of Civil Engineers. The Institution also allows entrants with substantial experience to apply without this level of formal academic achievement. In practice, most civil engineers in the United Kingdom work without chartered status. Australia and New Zealand typically require a four-year Bachelor of Engineering degree, including 12 weeks of work experience. In the United States, there is no single typical career path for civil engineers. Most engineering graduates start with jobs involving low responsibility, and as they prove their competence, they are given more and more responsible tasks. Yet, the details of a career path vary within each subfield of civil engineering, and even within different segments of each branch. In some cases, entry-level engineers may be asked to monitor construction in the field, serving as the "eyes and ears" of more senior design engineers. In other cases, entry-level engineers may be required to perform the more routine tasks involved in analysis or design. As they gain seniority, the engineers move into doing more complex analysis or design, manage more complex design projects, manage other engineers, or perform specialized consulting. Salaries for civil engineers in the United States have typically been lower than those for other fields of engineering, but entry-level salaries are higher than those in most non-engineering fields other than information technology. Civil Engineering Courses – MIT OpenCourseWare. This page was last modified on 23 February 2017, at 17:23.